Why Shop at Pc Pools? What is the expected delivery time of my pool supplies? 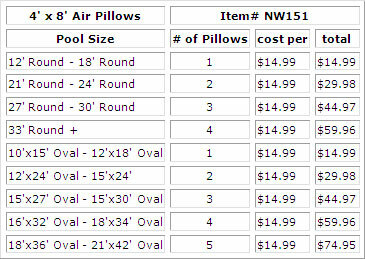 How many Air Pillows should I get for my winter pool cover? Why do I have grass growing through the bottom of the pool liner and is this covered under warranty? How can I find a leak in my pool liner? How many pieces of coping strips do I need to attach my pool liner? How much of a pool cove should I have for my above ground pool? What is the wall depth of a beaded/unibead pool liner? What is the lowest temperature to install a pool liner? Why doesn't my pool liner fit? What is the measurement on an overlap pool liner? What is the actual size of my pool cover? When should I cut in the pool skimmer and return when I replace my pool liner? Can I partially bury my above ground pool in the ground? Can I put rocks around the outside of my above ground pool? How much water does my swimming pool hold? What side of my solar pool cover should face up--bubble side up or down? Why heat my swmming pool? Is there enough sun where I live to run a solar pool heater? What size of pump do I need for a solar pool heater? How far away can I place my panels? How do I compare a gas heater to a solar pool heater? Can I install my above ground pool myself? About how much sand do I need to install an above ground pool? Can I put an above-ground pool anywhere? Can I move my above ground pool to a new home? How much does it cost to operate my pool pump? For an 18x33 or larger pool what size pool filter should be purchaced ? will my pool be delivered to my door or curbside? Can the pools stay up throughout the winter? How many times a month do I need to use pool chemicals? How often should I test the swimming pool water? How do I keep the pool chemicals from escaping through evaporation after they are added? We have owned a pool for a year, and I am afraid that we might already have a leak. I did the dye test and can’t seem to find where the leak could be. Could it be evaporation? How do I dispose of my pool water? I don’t want to let all the chemicals drain into the street and then into the sewage system. Why would I buy an above ground pool instead of an in ground pool? I’m a first time pool owner and there are lots of different pool chemicals to keep track of. What do I need to know about chlorine, pH levels, alkalinity, etc.? How do I connect the vacuum hose to the skimmer on an above ground pool? Do you have local installers you work with in the Grand Rapids or Lansing Michigan area? What does A.S.M.E for pool heaters mean? Why is cupro-nickel tubing in a pool heater important? Do I have to put any thing between my steps and the liner in my above ground pool. They are the stair type not the ladder type. My kids are up and down them and wondered if they could rub a whole in my liner? We bring you the best selection in pool products at the lowest possible prices…ALWAYS! Fast, Same Day, Free Shipping! All in stock orders placed prior to 3:00 p.m. EST Monday thru Friday (except all major Holidays) are shipped the same day received. EVERY order within the 48 contiguous states ships FREE! Our team of friendly customer service agents will help you with your order and answer your pool and spa questions before and after you buy from Pc Pools. You have 15 days from receipt of the product to initiate your return. You must contact us via email to customerservice@PcPools.com to notify us of your intent to return your order. We will instruct you as to the proper location to return your order. Do not return product without contacting Pc Pools for instructions as your return will be refused. Any item delivered by truck line service: ie..
To qualify for a refund, the product must be returned in its original condition, including original packaging, manufacturer's containers, documentation, warranty cards, manuals, and accessories. Do not mark or deface the manufacturer packaging in any way. We will not accept returns if packaging is not in its original condition we will return such products to you. If you reject such items returned to you, Pc Pools reserves the right to liquidate the inventory and withhold credit. All costs related to return shipping must be paid by the customer. When we receive and inspect your returned product, we will refund the amount of the product less a 20% restocking fee. Please see the map below to check estimated delivery time. At Pc Pools we understand that you want your products as soon as physically possible, and we are dedicated to do all we can to see that your needs are met. All over sized items shipped by truck line (above ground pools, in ground pools, pool heaters, pool slides, etc.) MUST be ordered before 11:30a.m. Central Monday thru Friday (except all major Holidays) in order to ship the SAME DAY. All other in stock orders are shipped out SAME DAY if ordered before 2 p.m. Central, Monday thru Friday (except all major Holidays). Pc Pools offers FREE shipping on most orders in the 48 contiguous states, except for a handling charge. Please check map for approximate delivery time. However, certain large or bulky items (such as swimming pools, pool liners, pool steps & ladders, filter systems, pool heaters, pool slides & diving boards, solar pool covers & solar reels, safety pool covers, etc.) may have an oversize shipping charge added to your purchase. 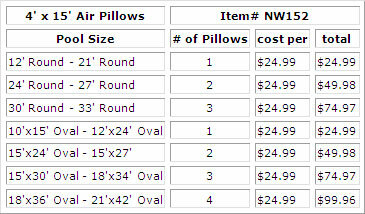 The additional charge will vary depending on the size and weight of the items. The oversized shipping charge will be clearly indicated on the shopping cart page in the "shipping" box upon checkout. Oversize item Delivery will be by LTL (Truck line) for a flat rate that will be denoted on the shopping cart page at check-out. Delivery is usually 7-10 business days, for in stock items. Set-up & assembly are not offered. Oversized items are not available for ground shipment outside the 48 contiguous states. Additional charges will apply for oversized items shipped to Alaska, Hawaii, and Puerto Rico. Pc Pools recommends shipping to a location where someone will be available to receive the delivery. Pc Pools cannot be responsible for packages delivered to unattended addresses. If you did not require your signature during your package delivery, PcPools.com will not be liable for all lost packages delivered with no presence of recipients or was left at the front door by the courier. 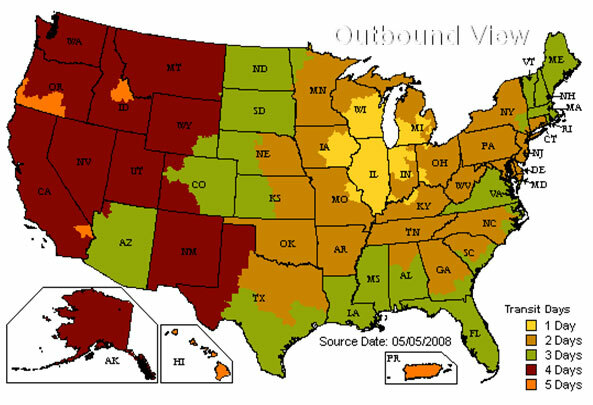 This map is for approximate delivery through common carrier ie. UPS and Fedex. Does not include any shipments by a truck-line service. A business day does not include Saturdays, Sundays, or holidays. Example: You ship a package on Monday that takes 2 business days to arrive. You do not count the day you ship as a business day, so your package would arrive on Wednesday, the second business day after the ship date. A unibead pool liner is a 2 in 1 pool liner. A unibead pool liner gives the customer an option to use the pool liner as a beaded pool liner which requires a bead reciever or as a J-Hook pool liner which just hooks onto wall of pool. This is not covered under warranty . The earth underneath the pool liner was not properly taken care of before intallation, thus causing sharp blades of grass to grow beneath the pool liner surface and poke through. Weed killer can be used but must be checked to make sure that it will not affect the pool liner in any way. To prevent pool liner damage from grass blades in the first place use Gorilla bottom floor padding. Take some food coloring and go to where you think there might be a leak, if so the food coloring will be drawn to it. Use EZ Patch 28 kit. Multiply pool size by 3.14, round it up and divide by 2, this equals number of pieces of coping. There should be a 4-5 inch cove. 48" pool liner measures 43" and a 52" pool liner measures 45 1/2". 65 degrees for a beaded pool liner and 60 degrees for an overlap pool liner. An overlap measures 54" and is used both for 48" and 52" wall. 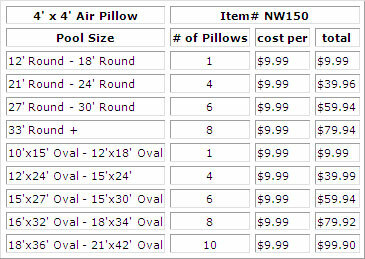 Winter pool covers for round/oval above ground pools have 4ft extra fabric. Winter pool covers for rectangular in ground pools have 5ft extra fabric. Safety pool covers will have 2ft extra fabric. The skimmer and return should be cut in when the pool is 1/3 to 1/2 of the way full of water. This will allow the pool liner to stretch into place before any cuts are made in it. If this step is done prematurely it could cause the pool liner to tear, or wrinkles to form. The swimming pools that we sell are designed as above ground swimming pools. They are not intended to be sunk in the ground. Because of this, we do not recommend that you sink your above ground pool into the ground. If you choose to go ahead and do this anyway please be aware that you may encounter some problems down the road. For example, the corrosion process will be accelerated, and the backfill may cause the walls to cave in if the water level is ever reduced. You should also check all safety and local codes before sinking an above ground pool as it may not meet the standards once this is done. Just as we recommend with the pool base, decorative rocks are okay to place around your pool as long as you do not use any substance with high alkaline or acid content as it will corrode the metal parts of your pool. Products such as wood chips are also potentially harmful to your above ground pool wall because they retain moisture. If the metal parts are constantly wet, then they will corrode faster. To prevent this from happening use a materiel that allows the moisture to drain through at a normal pace. 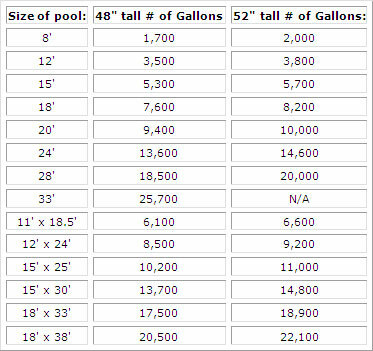 The following is a list of approximate gallons for our common pool sizes. All numbers are for flat bottom pools. Tip- 1 inch = 0.0833 foot. To calculate the amount of gallons for irregular shapes split the pool up into regular shapes. For example an oval pool is made up of 1 rectangle and 2 1/2s of a circle. Use the formula to get the gallons for each part and add them together to get the total gallons. Your swimming pool represents a significant financial investment. Heating your swimming pool enables you and your family to enjoy your investment more than just a few months a year. Heating your pool enables you to comfortably enjoy your pool - earlier in the spring, evenings after work, and later into the fall. A warmer pool means more time for family fun, more opportunities for healthy exercise, and a better gathering place for family and friends. Cold pool water is pumped from your pool through our patented solar tube design where it is warmed by heat collected from the sun. This is very much like the water that sits in a garden hose and is warmed by the sun. The warm water is then pumped back into your pool giving you luxuriously warm water and plenty of extended swim time. A 1 horse power pump works well but a 1.5 - 2.5 horse power pump works better. With a 1 horse power pump you can have the panels up to 30 feet away, any more than that you should go with a larger pump. We think so. A solar pool heater can be less expensive up front than a gas heater, depending on the size of your pool. Once a solar pool heater is installed, your heat is FREE from the sun. With a gas heater you need to pay the gas company depending on how much you use the heater (your pool store can give you estimates for your area). In the spring and fall when you really need heat, you use the pool heater more, so it costs you more - but solar energy is still free. Also, solar is non-polluting, and it can cool your pool during hot months, something no gas heater can do. First check the operating costs. Will you really be willing to pay the gas bill, or will you shut off the pool heater when you need it most? Second, ask about annual maintenance costs. Solar has none. Also, determine the life of the system. Solar pool heating systems can last 15-20 years. Lastly, what are you really trying to accomplish with a pool heater? If you want your pool to be a comfortable swimming temperature all season long, then choose solar. solar systems have the longest lifespan (no moving parts, no corrosion) - almost always outlasting their warranties. Yes you can! Our above ground pools are designed to assemble quickly and easily by do-it-yourselfers. An installation DVD and or a detailed installation manual is included with each above ground pool. The placement of an above ground pool should be on a surface that is firm and level to within 1 inch. It must also be designed to hold the weight of the water, so a deck is not advisable. It is also not recommended to put the pool on asphalt or concrete, the petroleum in the asphalt will eat through the pool liner and the concrete will cause friction and tears. It does take a significant amount of time to dismantle and move an above ground pool. Usually when you drain and remove the vinyl liner it will probably need to be replaced because of the stress and shrinkage on the pool liner. If your motor nameplate says at 15 amps hen supplied with 110 volt service, and 7 amps when supplied with 220 volt services. The schedule for backwashing of the filter is a factor of how much the pool is used and how dirty it gets in normal service. Unless your pool gets very dirty, you won't need to backwash it. Sand filters can be backwashed once a month and torn down twice a year. Usually any thing 24 round or 12x24 and above we recommend getting a 1 1/2 hp pump and filter. We sell replacement pumps and filter systems with pumps together, but we do not sell the filter tank by itself. The filter systems with both the tank and pump are sized to work together. Thank you for your question. The drivers are only required to take it to the end of your driveway. Pool chemicals should be used approximately twice a month to deal with algae and curb bacteria growth. The filtration process should eliminate much of the waste, but some is bound to remain. Pool sanitizing chemicals are perfect to get rid of the rest of the algae and bacteria. Use ph level testing techniques to test the acidity of your swimming pool. The most common form of testing is simply using a pH level testing strip, which changes color according to its acidity. In order for chlorine to work properly, the pH level must be at its desired point. Fortunately, most pH level testing strip kits come with descriptions of what level each pool should be at. Achieving pH balance is critical to pool health in that high pH slows chlorine / sanitizer activity, while low pH speeds chlorine activity but may lead to strong chlorine odor and an acid feel to the water. Two types of pool covers help in this situation. First, insulation starts at the water’s surface and is best achieved with a solar pool cover. Using a solar cover that perfectly fits your pool will keep evaporation from occurring overnight. A winter pool cover can also be used, although keep in mind that winter pool covers will prevent evaporation, but will not insulate and heat the pool at the same time. One can use both at the same time for better insulation, but the solar pool cover will not absorb any sunlight with a tarp over it. It could certainly be evaporation causing the water loss in your pool. Many times the water level drop off is common in extremely hot areas. To test for pool water loss due to evaporation, get a large ten-gallon bucket and fill it about halfway with pool water. Mark the level of the water in the bucket with duct tape or with a permanent marker and do the same to the level of the water in the pool (Note: do not use a permanent marker on the pool wall, as it will likely not come out.) Place the bucket next to the pool in an area where it will receive the same amount of sun as the pool itself. Turn off your pool pump and keep all swimmers out of the pool for a few days. Three of four days later, check on the level of evaporation of the water in the bucket compared to the level of evaporation in the swimming pool. The amount of water level drop-off should be similar between the bucket and the pool to deem it an evaporation issue, and not a leak. If the pool water level has dropped more, then it is most likely a leak.. If it is an evaporation issue, it might be time to invest in a solar pool cover. Every state pollution control association has its own policies, but generally the water should never be discharged into a body of surface water – that is, lakes, streams, wetlands – or septic tanks. The longer the water has stood without chlorination, the better. Contact your local pollution control associations for details on how to be rid of your pool water. For instance, many cities require that pools be drained to the sanitary sewer, such as a basement drain rather than into a storm sewer. Breaking code can lead to a hefty fine. An above ground pool is a great way to provide a fun swimming experience for your family at a more affordable price than most in ground pools. Above ground pools typically use less pool chemicals and the accessories usually cost less than those of an in ground setup. 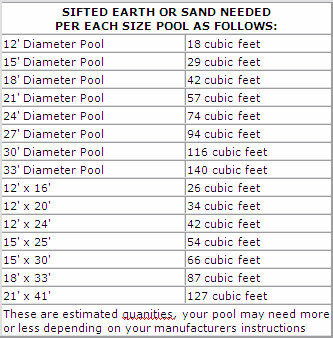 Here is a reference chart for one of our pools, please use this as a reference only and follow your own pools instruction for installation, usually you would need around 2 inches of sand. All materials used in the manufacturing of an A.S.M.E. Heat Exchange, copper finned tubing, tube sheets and even stud bolts, are brought into the manufacturer and held for inspection by a State Inspector. The manufacturer is charged for every visit by this inspector. The inspector will come in, review all the materials, data reports, etc. proving that all components have met rigid A.S.M.E. standards. Once the materials have passed, the heat exchange assemblies are water pressurized, up to 260psig. and then the exchanger is closely inspected by the State Inspector. Once all tests are preformed and the exchanger has passed test, the inspector will sign off on the Data Report, which are then filed at National Board, (who retains records of all the manufacturers ASME certified products). Some states or counties may require the use of A.S.M.E. heat exchangers used in pool heaters, please refer to your state and local ordinances. The ASME copper finned tubes are thicker than the standard copper finned tubes used on residential pool heaters. Cupro-Nickel- is an alloyed metal, used in heat exchangers to add strength and corrosion resistance. Comprised of Copper and Nickel. Cupro-Nickel products are 90% copper and 10% nickel. If the heater is installed in an area known for hard water, (above 25 Grains of Hardness per Gal. ), the use of cupro-nickel tubes in the heat exchanger can allow for the flow rates to be accelerated to scour the tubes and help prevent scale build up. It is usually recommended by the manufacturer to add a pool step pad, to protect the liner. We have 3 different sizes.